Organization’s new leader looks forward to expanding off-road riding opportunities in Maryland. effective January 1st, 2019. A board member for the past year, James is an experienced and effective advocate for motorized recreation of all kinds in Maryland. 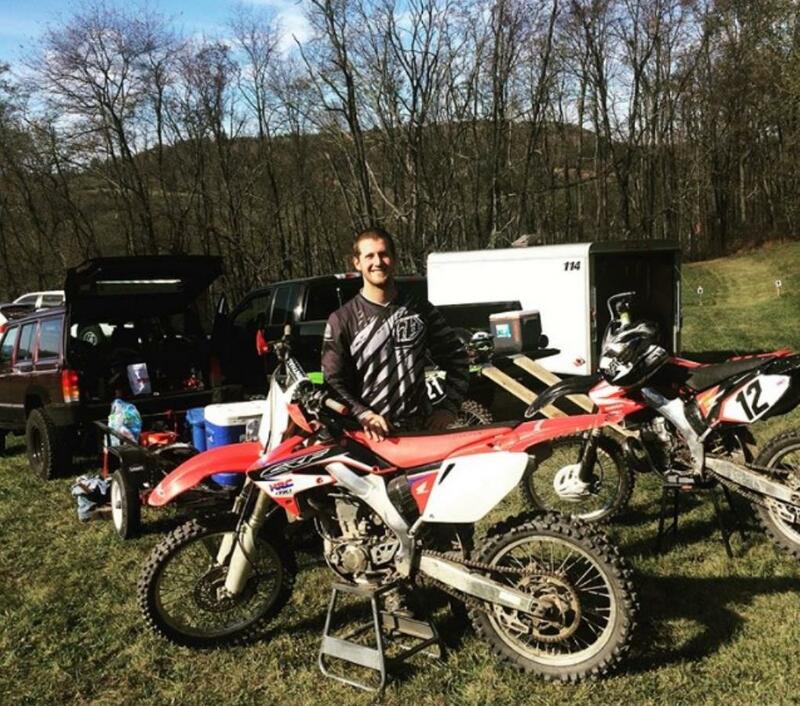 He has been riding dirt bikes with family and friends since age 10, has raced in many hare scrambles, and is a long-time member of a local motocross club. “James has a strong drive to advocate for all enthusiasts of off-highway vehicle (OHV) recreation, including those who enjoy riding on ATV trails, technical single-track motorcycle trails, full-size 4×4 rock crawls, and motocross tracks,” said Ken Kyler, organization president. James is a graduate of Frostburg State University, with a degree in Physics and Engineering, and brings to the post of MDOHVA president many years of experience in commercial construction management. Over the years, he has hosted rides on his family’s private property in western Maryland that were open to dirt bikes, ATVs, multi-passenger side-by-sides, and full-size 4×4 vehicles. 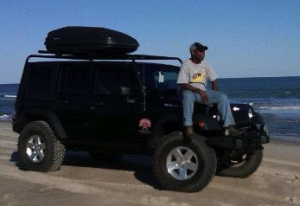 The Maryland OHV Alliance, Inc. is a state-wide body of OHV recreation enthusiasts. It advocates for responsible OHV recreation and resource protection by working in partnership with private and public land managers and recreation planners; provides and promotes best management practices for OHV recreation planning, development and management to policy makers; promotes a positive OHV recreation image to all publics; and emphasizes the benefits of responsible recreation behavior and raise awareness of the impacts from irresponsible recreation activity. Since its founding, the MDOHVA has been successful at advocating for ORV recreation resulting in the MD DNR building the St. John’s ORV Trail and Campground in the Savage River State Forest, and more recently supporting DNR’s acquisition of land for the Wolf Den State Park near Kitzmiller which will be the State’s first ORV State Park. 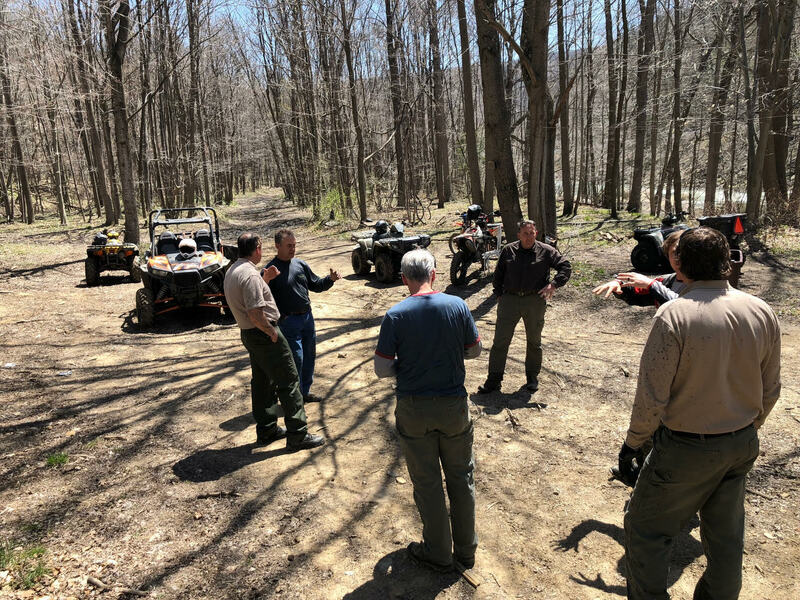 Frederick, MD — April 10, 2018 — The Maryland Off-Highway Vehicle Alliance, Inc. (MDOHVA), in partnership with the Maryland Department of Natural Resources (DNR), completed the first phase of an assessment of property purchased by the DNR in western Maryland for a new State Park. The Maryland Department of Natural Resources has acquired approximately 2,009 acres in Garrett County, near the town of Kitzmiller. The property will potentially provide a wide range of recreational opportunities, including hiking, biking, camping and trail riding with off-road vehicles (ORVs). Two of the three parcels purchased are adjacent to the Potomac State Forest. MDOHVA contracted with Applied Trails Research to do an assessment of the existing trails on the property, funded with grants from Polaris Industries, Rugged Ridge and DNR. The initial assessment is complete and the next phase is to analyze the data, create the inventory and final report. The trail inventory will include GIS data and annotated maps, helping DNR create a strategic management plan for the property, including public access and trails that potentially could be opened in 2018. As this project moves forward, there will be opportunities for public comment and involvement throughout the planning process. Applied Trails Research is a full-service outdoor recreation firm that specializes in sustainable trail development, and a member of the Professional Trail Builders Association. The Maryland OHV Alliance, Inc. is a State-wide body of off-highway vehicle recreation enthusiasts. It develops and provides a wide spectrum of programs, materials and information, or “tools,” to individuals, OHV clubs, associations and agencies in order to further a positive future for responsible OHV recreation. For more information go to http://mdohvalliance.org/ or email info@mdohvalliance.org. Of Maryland OHV Alliance, Inc.
Frederick, MD — February 15, 2018 — The Maryland Off-Highway Vehicle Alliance, Inc. (MDOHVA) is pleased to announce that Daryl Anthony has joined its board of directors. Daryl recently retired from the Maryland Department of Natural Resources, where he served as Assistant Secretary of Land Resources. “Daryl has been instrumental in bringing new opportunities for off-highway vehicle (OHV) recreation to Maryland and is a strong supporter of the Maryland OHV Alliance. We’re excited to have him join our 9-member board as we continue to expand trail-riding opportunities in the State,” said Ken Kyler, organization president. Anthony served as Assistant Secretary of Land Resources, starting that role in July of 2015. He first joined the department in 1983, as a contractual seasonal ranger at Patapsco Valley State Park, while earning his Bachelor of Science in Recreation and Park Management at Frostburg State University. In 1995, he was promoted within the park service from sergeant and assistant park manager, and in 1999 to captain and southern region manager, and later served as regional manager in the central and western regions. Daryl is an avid outdoorsman. He spends much of his free time mountain biking, camping, hiking, fishing, kayaking, and most importantly exploring off-road trails throughout the country in his Jeep with his family and friends. The Maryland OHV Alliance, Inc. is a State-wide body of off-highway vehicle recreation enthusiasts. It develops and provides a wide spectrum of programs, materials and information, or “tools,” to individuals, OHV clubs, associations and agencies in order to further a positive future for responsible OHV recreation. For more information go to http://mdohvalliance.org/ or email info@mdohvalliance.org. Maryland OHV Alliance promotes safe, sustainable off road recreation in Maryland. 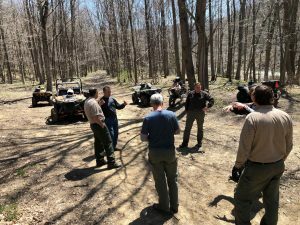 The Alliance worked with the Dept of Natural Resources along with other State agencies and officials to open the first of its kind ORV Park in Maryland. Paul Peditto offers insight. The day we at the Maryland OHV Alliance have waited for after almost six years of effort. A glimpse of the events on opening day. Thanks to Yamaha and Polaris for their support! The AMA, the National Off-Highway Vehicle Conservation Council and the Maryland Off-Highway Vehicle Alliance have been working together in western Maryland to open an OHV park following trail closures at three of the state’s off-highway vehicle riding areas: the Green Ridge Trail at Green Ridge State Forest; Chandler Trail at Pocomoke State Forest; and Poplar Lick Trail at Savage River State Forest. All were permanently closed by the Maryland Department of Natural Resources and establishing a new trail at Savage River has been the cooperative focus to date. As we’ve all learned, no OHV effort succeeds overnight and significant enthusiast support is a critical element. Though just in its fourth year, MDOHVA has been very effective reaching key players in the riding community – as well as state, county and local officials — to promote the opening of OHV parks. In September 2014, MDOHVA teamed with NOHVCC and AMA to introduce Maryland DNR staff to OHV trail construction and management concepts proven around the country. In July of 2015, MDOHVA and the AMA met with Secretary of Natural Resources Mark Belton and newly-appointed Assistant Secretary for Land Resources, Daryl Anthony. Sec. Belton understands the positive economic impact of OHV recreation and Daryl Anthony, a longtime off-road Jeeper, is a strong supporter of the concept. With their help and other connections in the Gov. Hogan’s administration, a 2017 Savage River OHV trail opening is planned. The Savage River Trail System will include group and private camping with a tot-trail between the sites. A first for Maryland, the system will include a rock-crawl for ATVs and 4-wheelers. 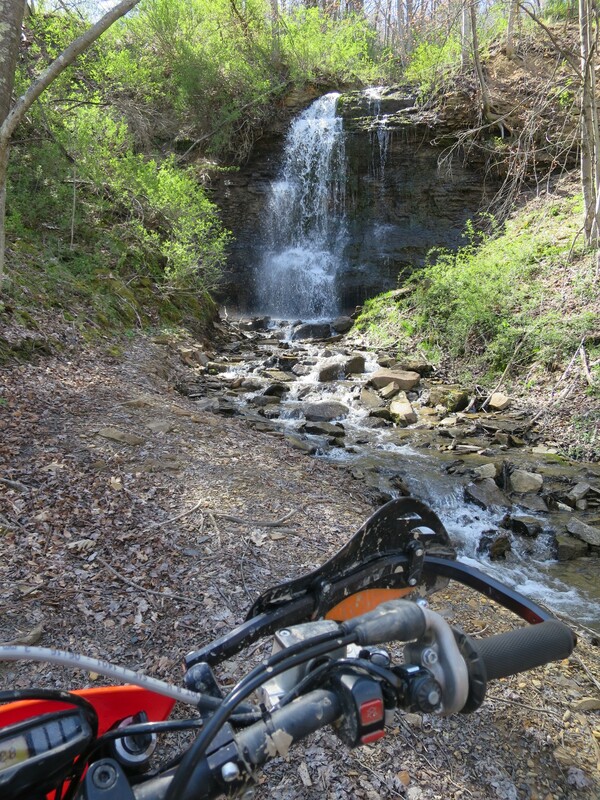 The trails themselves will have sections appropriate for motorcycles, ATVs and UTVs. As the MDOHVA and the AMA have promoted the economic benefits of organized OHV recreation on state land in western Maryland, other communities have come forward looking for local parks of their own. We’re looking for volunteers to help maintain the trail system coming to Savage River as well as be an ambassador to riders on the trail, and spearhead efforts in other parts of the state to establish more public OHV recreation. If you’re serious about seeing OHV trails come back to Maryland, whether on public land or private, please contact the AMA at grassroots@amacycle.org (or info@mdohvalliance.org). Let us know if you and your riding buddies have the time and energy to help maintain the momentum started at Savage River, or can help with the political and organizational hurdles at other locations where the MDOHVA and the AMA hope to open trials. Now more than ever, it is crucial that you and your riding friends become members of the AMA to help us protect our riding freedoms. More members mean more clout against the opponents of motorcycling, and your support will help the AMA fight for your rights – on the road, trail, racetrack, and in the halls of government. To join, go towww.americanmotorcyclist.com/membership/join. To encourage your friends to join, tell them about the many AMA benefits you appreciate and forward the link to them.